Perspective or how we see things determines how we live our lives or react in any given circumstance. Without good perspective, even everyday living can become a burden. Each day we have deadlines to meet, bills to pay, and appointments to keep. We have houses and cars to maintain. We have relationships with spouses, kids, parents, siblings, and friends to nourish. Our lives are full of stress, stress, and more stress. Plus, we have those unexpected inconveniences which can be time consuming and throw us “off our game.” It’s overwhelming. When we get overwhelmed, it’s hard to discern the difference between an inconvenience and a tragedy. 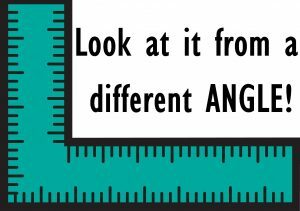 This is why perspective is so important. Do we muddle through life or look for God in all our circumstances? Do we view others as an inconvenience or as children of God? Do we see problems or possibilities? Do we focus on conflicts or do we focus on Jesus? Do we make mountains out of molehills or molehills out of mountains? Do we discern what is really important or stay in a perpetual state of crisis management? We must focus on Christ and ask God for His peace if we are to experience joy in our daily lives. 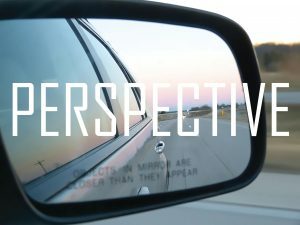 Keeping good perspective helps us evaluate our circumstances. A flat tire, a snoring spouse, a missed appointment, a late airplane, a lost game, the guy who cuts us off in traffic, the gossipy co-worker, a criticism, the slow Internet connection, the stock market being down, or our weight being up is not as big a deal as a loved one dying or finding out we have cancer. Of course God can take care of even the direst of situations but we could save ourselves a lot of turmoil and grief if we didn’t act like a bad hair day is the end of the world. Consider this… a bad day is not a bad life. Before we over react, we might want to ask ourselves if it what we are experiencing will really even matter to us five years from now, much less to anyone else. Keep a healthy perspective. Don’t look down at the ground; look up to Christ. With Christ in our lives all is not lost! Most times it’s not as bad as we think! As Scarlet O’Hara would say, “Tomorrow is another day!” Let’s get a good night’s sleep and wake up with the knowledge that God loves us! Always keep this perspective in mind – with God in our lives, each day and every tomorrow can be filled peace and joy. Two people can look at the same thing and see something different. Be the person with the good perspective. Then you will be able to see more clearly.